Amsterdam, Jan Jansson, 1641. French text edition. 345 x 440mm. Original colour. Japan, with Korea shown as an island. 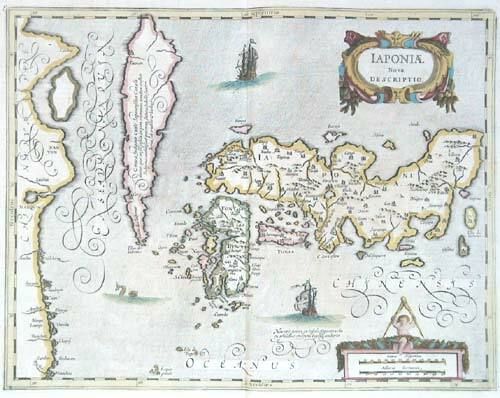 This is the second state of the plate, introduced 1636; the title and cartouche have been altered, and a galleon has replaced the original junk in the sea under the island, although the Latin description underneath still refers to the Japanese craft. This is a genuine antique print, published at or about the date specified, but guaranteed over 350 years old.